Wabash College’s Visiting Artists Series will present the Lloyd Carr-Harris String Quartet, 8 p.m., Wednesday, October 19, in Salter Concert Hall in the Fine Arts Center. 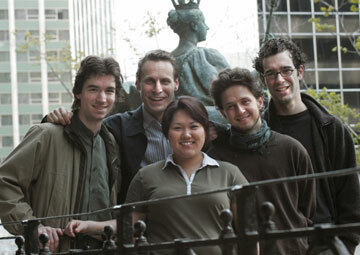 The Lloyd-Carr Harris String Quartet (Emmanuel Vukovich and Aya Ito, violins, Frederic Lambert, viola, and Christian Elliott, cello) was formed in 2002. Its members are all in the Bachelor of Music program at McGill University in Canada and are recipients of a scholarship from the Lloyd-Carr Harris Foundation, which supports string studies at McGill. It is the first Canadian ensemble ever to win the grand prize at the prestigious Fischoff National and is perhaps the most respected young ensemble in Canada. The Quartet performs the works of Haydn, Mozart, and Beethoven, but also has recorded the work of contemporary Canadian composers.